Line up for licensing, world+dog? Apple was granted two dozen patents in the US Patent and Trademark Office's weekly patent-palooza, held each Tuesday, providing Cupertino's legal team with a new cache of ammunition to be fired up in future patent wars. Snuggled in amongst Tuesday's hoard is a patent entitled "Multipoint touchscreen" that could potentially be big trouble for manufacturers of other multi-touch devices – such as, oh, practically every other smartphone and tablet on the market. Now, your Reg reporter doesn't claim to be a patent lawyer ("Thank you, Jesus! "), but to our untrained eyes that reads mighty like a description of every multi-touch touchscreen in existence today. Hmmm... Might Apple now own the rights to all multi-touch display designs? The text of the patent refers to touchscreens in general, but explains that one of the problems associated with them is that "they lack the ability to track multiple points of contact simultaneously," unlike the eponymous multipoint touchscreen described by the patent. Apple's patent attorneys evidently spent a good deal of effort putting together this possibly blockbuster document, seeing as how it includes references to 365 US and 74 foreign patents dating back to a 1956 patent granted to one George M. Kirkpatrick for an "Extended Range Frame Comparator", as well as an additional 202 references classified simply as "Other". 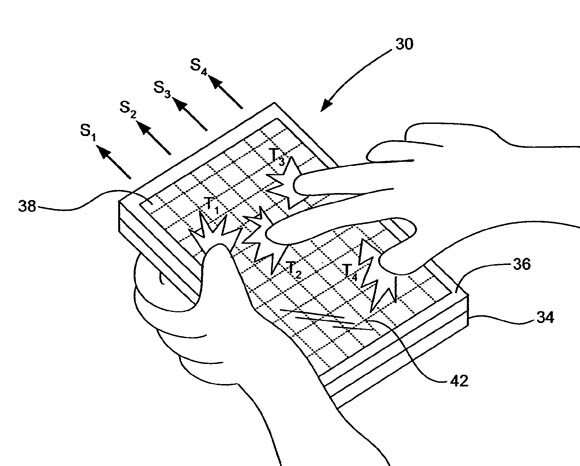 Four other multi-touch patents were also granted to Apple on Tuesday. One, entitled "Multi-touch auto scanning", describes a method of powering down a device's processor and clock, and using separate low-power circuitry to periodically check to see if a touch is being applied to the display. Two others, "Full scale calibration measurement for multi-touch surfaces" and its nearly identical twin of the same name describe a method of ensuring that touch-induced signal strength is normalized across a display when vagaries of manufacturing and "physical design differences" cause signal strength to vary. The last multi-touch patent granted on Tuesday doesn't describe touch displays, nor even multi-touch control per se – but it is related. "3-dimensional curved substrate lamination" outlines the method used to manufacture curved-surface pointing devices such as Apple's multi-touch Magic Mouse. "Use of multiple related timelines" – the ability to use multiple video-editing timelines in "the decoding and display of a media sequence"